Something to look forward to next spring! Fall has definitely arrived here in the foothills with the first rain storm last week. Three days of a deluge, and now beautiful, crisp, sunny days and fire-time nights. All the oaks are turning yellow, the days short and sweet. Halloween approaches next week and close on its heels, Thanksgiving, the epitome of fall harvest and abundance. It’s a time for gratitude (of course, any time really is) to the earth, the sun, the soil, everything that conspires to bring us this incredible nourishment. It’s such a mystery and such a simple thing, yet think about the miracle of planting a seed and the seed unfolding into a spreading pumpkin plant. It’s pretty amazing. This time of year, my pantry is full of canned and dried foods, potatoes and winter squash precariously stacked in the corner of my bathroom, and the freezer jammed to the point of things falling out when I open it. I feel so safe, so securely provisioned for the winter. A full pantry and a full woodshed at the onset of November are the definition of wealth in my opinion. And now, sitting on my couch, watching the afternoon sun through the window grace the ridge across the valley, I want to express my gratitude to all our wonderful CSA members. Thank you for supporting us this season with your money and time. 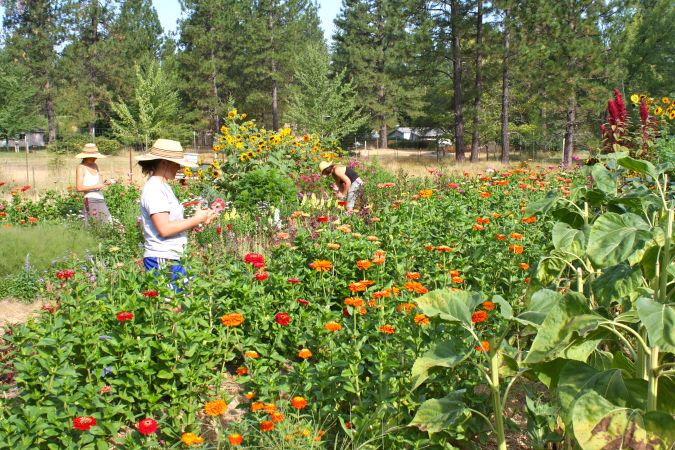 Thank you for investing in small, local farms and trying things you may have never tried before. Thank you so much for coming with your bags and boxes every week and oohing and aahing over the veggies. Maisie and I couldn’t have done it without you! Enjoy the last harvest and get some cozy time this winter! My friend Stephanie Rosenbaum is a great chef and cookbook author and recently sent me this recipe, which I plan on trying as soon as possible. I recommend you do to! For Pumpkin Doughnut Holes click here. Parsnips: I like to roast my parsnips in a simple fashion. Just cut them into small chunks coat with olive oil and salt and roast in the oven until soft and slightly crispy around the edges. They are also great in chicken soup. Its Raining Cats and Dogs! And, Apparently, Tornadoes. Wow oh geez oh my, its really coming down! Julius and I are tucky tucked into the trailer, warm tea in hand and freshly baked pumpkin muffins on the counter. Today I have been dreaming about Baja. Today I have been anticipating tomorrow’s wet harvest. Today marks almost a week until our season is over and the wide-open expanse of winter awaits! Which means only one more CSA pick up after this one. Take note dear members, and be sure to come collect tomorrow, as we’ll have butternut squash that you will not want to miss! Rain or shine we’ll be there! Anticipated Harvest: Butternut Squash, Garlic, Cilantro or Dill or Parsley, Bok Choi, Chard or Collards or Kale, Green Tomatoes (and maybe even some red ones), Tomatillos, Carrots, Broccoli or Cabbage! I may be forgetting something, but I’m not about to go out there in my skivvies and check! This recipe was given to us by our Living Lands Intern, Katie. Another intern, Lauryn, ate these the other day, and said, “It might just have been the best thing I have ever eaten.” Enough said. Cut large green tomatoes into 1/2 inch slices Sprinkle lightly with salt and let sit for 10 minutes (this sweats some moisture and bitterness out) For the breading process pull out three bowls, in the first, put a few cups of chickpea flour. In the second, put 4-6 eggs and a dash of milk or buttermilk (whisk together well). In the third, mix chickpea flour, cornmeal, corn flour, and salt and pepper (can add a dash of cayenne as well), mix together well. Place each tomato slice in the first bowl, turn the tomato so it has a nice layer of flour attached to it, shake it off and then move it to the second bowl. Coat it with the egg mixture and allow the excess to drip back into the bowl. Place in the third bowl and pat the flour mixture onto the tomato slice, making sure to get the sides of the tomato as well. Gently shake off the excess flour, and place the tomato on parchment paper until you are ready to fry. Repeat this process for each tomato slice until they are all breaded. For the frying process, heat up a 1/2 inch layer of canola oil (or other high heat option) in a cast iron pan, until it has the consistency of water. Place as many tomato slices into the pan as will fit in one layer and allow to fry, flipping once, until both sides are a healthy golden brown. Place in a low oven on parchment paper until all of them are fried and ready to eat. If oil starts to brown, pour out and replace with fresh oil. Top with Meg’s cashew sauce and enjoy! Blend the cilantro and jalapenos in a small food processor, add some of the nuts (~1/2 cup) on top of the veggies and continue to process until the mixture is well blended and somewhat pasty. Remove the mixture from the processor and put in a bowl. Add the rest of the nuts to the processor and blend until chunky. Pour the chopped nuts on top of the veggie blend and mix together. Add honey and vinegar in a 2:1 ratio until the sauce has a sticky consistency and you are happy with the level of sweet and sourness. Enjoy! This is the opposite of what it looks like today. 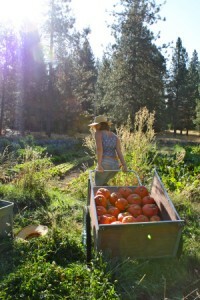 Harvesting squash in the autumn sunlight! Here’s to pumpkins, here’s to fall, and here’s to curling up in front of a fire with your sweetie, drinking hot drinks and watching the rain squall. That’s my plan, as soon as it starts to rain that is. We just planted cover crop this morning, and our irrigation water from the NID ditch turned off last week for the winter. So now we are waiting patiently for the rain, waiting for it to wake up all those little bean, vetch, and rye seeds. For now they are cloaked under a layer of rich soil, and hopefully the birds won’t find them as it’s likely to be another week of dry, 80 degree weather. Thus is the farmers lament, it’s dry when you want it to rain, and wet when you want it to be dry. And you just really have no control over it. Over the last five years of farming in earnest, one lesson that’s hit me over the head over and over again is non-attachment. Farming is the ultimate test in faith. You do everything you can do, and then hope for the best. Sometimes, a huge hail storm comes in June and takes down all your tomato plants. Sometimes a foreign pest sneaks into your field and eats all your seed potatoes just a week after you’ve planted them. I’ve seen an evolution time and time again, of a first-year farmer falling to pieces over things like this to three years into it realizing that you just can’t let it faze you. This has been my journey, and I’m finally coming to realize that no matter what the circumstances, something is going to go wrong, and something is going to surprise you with its success. Of course, life is like this, and of course there are a million analogies one could make to practice this age-old wisdom of the buddhists. But it really is the key to success and happiness. I know it. Because when I think back on all those times of hardship or pain, it was because my expectations were firmly cemented into my head. When expectation is fluid, joy can find you in the most unusual of places. The shallots are still green (they still have the green tops on them) and make for a delicious salad dressing. Just throw the shallot greens in a blender or food processor with some olive oil, balsamic vinegar and a little salt and puree. You get a delicious, creamy, green-goddess-like dressing. 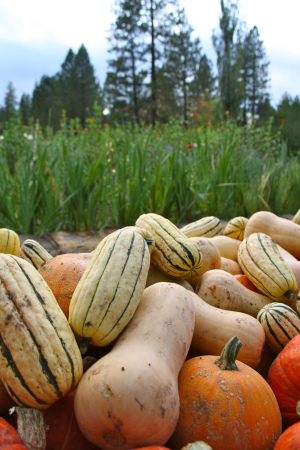 The Kabocha squash is one of my all-time favorites. Just cut up, scoop out the seeds and bake in the oven for about an hour. You get a delicious, sweet, dry-textured squash, much like a chestnut. I like to just eat them plain, but with a little butter they are divine! Look at this picture from this same date last year. Totally raining. And look at all those unprepared and inappropriately dressed farmers! Turns out that tossing squash during the first rain is just as much fun as jumping in puddles! I am excited to give you squash during these next few weeks. Sometimes people get intimidated when they go to cook a squash. I tell them not to worry so much, you can’t get any easier than preparing a squash. And for starters we are giving you the delicate delicata squash to try. Just cut it lengthwise in half, scoop out the seeds, drizzle with olive oil and sea salt, put the two sides face down on a baking dish in the oven and put some water in the bottom of the pan too, and bake at 350 until the squash is soft and maybe even a little browned on the bottom. Wahla! Flip over, put on a plate, fill with sauteed onions, kale, and quinoa, or just eat plain. Lettuce, Kale/Collards/Chard, Tomatoes (the last of ‘em), Peppers, Eggplant, Tomatillos, Sweet Turnips/Bok Choi, Parsley/Basil, Rainbow Sparkly Potato (we named ‘em), Purple Mist Garlic (also named ‘em), and DELICATA SQUASH! Enjoy! Some beautiful potatoes for you! 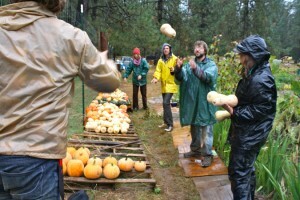 This week we are harvesting our potatoes for the first time, and hope to have a generous haul to give out to the CSA. Potatoes are a truly versatile crop. 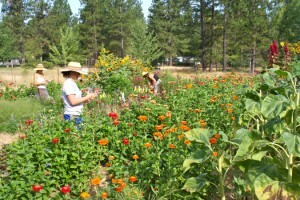 You can plant them in the fall (if you have a warm, well-drained area) and again in the spring. You can harvest them new, or wait until the plants have died back and the skins have toughened. You can also easily save seed, as to plant potatoes you merely plant a piece of a potato that has a few eyes. 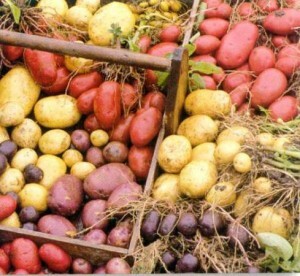 There are literally thousands (close to 4,000 according to Wikipedia) varieties of potatoes, ranging in all kinds of beautiful colors from pale pink to deep indigo. Harvesting potatoes is one of my favorite activities on the farm. Sink the shovel into the soil, upheave the dirt and sift through to find the round, knobbed treasures. Hopefully you haven’t cut through any potatoes, or the gophers haven’t found them first. Here’s a nod to the proud and noble potato by Pablo Neruda, noting aptly the politics of the origins of the potato in South America, and it being one of the many treasures plundered by the conquistadors of Spain. out upon the austral ocean. as though stocking a nest. birth rate of your roots. Kale is one of my favorite vegetables. It is so versatile and delicious, I can usually include it whatever I’m cooking. It’s also extremely nutritious and easy to grow. I encourage you all to start experimenting with kale if you don’t like it yet. The fall kale is coming on strong and should be particularly sweet and tender these last few weeks of CSA. To toast pine nuts, place on a cookie sheet or pie tin and bake at 325 for 5 minutes or until golden brown. Take care not to burn them. Wash kale and strip off stalks. Roughly chop kale. Bring the water to a boil in a 10 or 12 inch skillet with a tightly fitting lid. Add kale and cook, covered, over high heat, stirring occasionally, until tender, approximately 5 minutes. Remove and drain, saving the cooking liquid to drink. Rinse out and dry the skillet, then use it to heat the olive oil over medium heat, lifting and tilting the pan to coat. Add garlic and saute for 15 seconds. Add raisins and saute for 30 seconds to one minute, stirring constantly to prevent browning or burning. Raisins should be glossy and slightly puffed. Add greens and stir to combine. Season with salt to taste and cover for a minute until greens are heated through. Serve hot, garnished with the toasted pine nuts.